WASHINGTON (Reuters) - White House adviser Kellyanne Conway On Sunday said she did not believe President Donald Trump had advance knowledge that WikiLeaks founder Julian Assange was going to be arrested by the British police and charged by U.S. prosecutors. "Not to my knowledge," Conway told NBC's "Meet the Press" show, when asked if Trump knew ahead of time about Assange, who last Thursday was hauled out of the Ecuador's embassy in London where he had taken refuge since 2012 to avoid extradition. Lawyers for Assange said he may risk torture and his life would be in danger if he were to be extradited to the United States. They have also suggested the charges could chill press freedom. Conway said she believed Trump did not have any knowledge of what was going to happen to Assange but added that based on her numerous conversations with him on the issue, he is against releasing such classified information. "The President believes that those who publish classified information should not do that," she said. "...So anybody who's publishing classified information, in our view, should think thrice before they do that because you can imperil folks." Trump in 2016 said "I love WikiLeaks" after the website released emails that U.S. authorities have said were hacked by Russia to harm his election opponent Hillary Clinton. 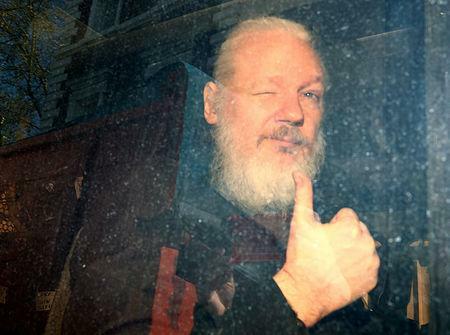 On Friday, he told reporters he had no opinion on the charges against Assange. "I know nothing about WikiLeaks. It's not my thing," Trump said. Assange's U.S. indictment arose from a long-running criminal investigation dating back to the administration of President Barack Obama. It was triggered in part by WikiLeaks' publication in 2010 of U.S. military reports about the wars in Afghanistan and Iraq and the diplomatic communications - disclosures that embarrassed the United States and strained relations with allies.